The Florida Keys are recognized as the birth place of flats fishing, and they remain at the center of the universe for modern flats fishing aficionados. 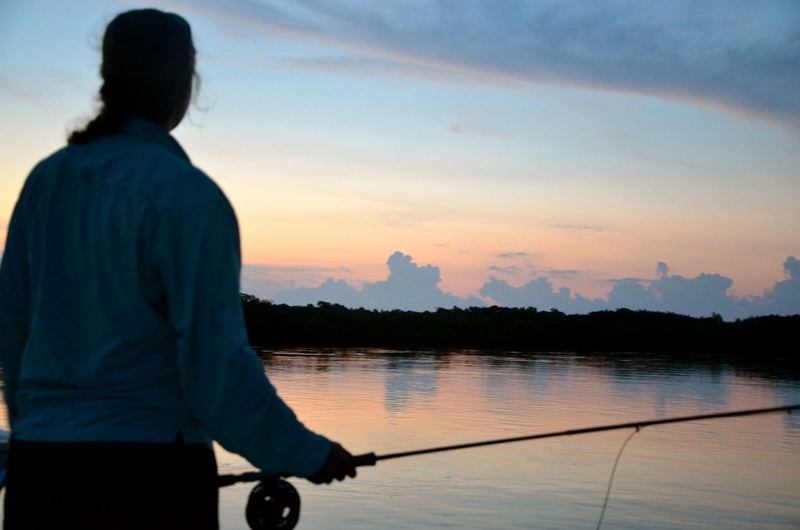 Despite this long history and the continued fervor of flats anglers in pursuit of bonefish, tarpon, and permit, we find ourselves fighting for the health of the flats that have provided so much to so many for so long. The multi-year Florida Keys Initiative will engage in research, conservation, and education to protect and restore these valuable fisheries, their history and culture. Although still one of the world’s top destinations for flats fishing, the habitats and fisheries of the Keys are not being cared for as they should. Water flowing from the Florida Everglades, for example, is highly altered: it contains a slew of nutrients and contaminants; when, where, and how much fresh water flows from the Everglades is greatly altered from its natural pattern. These changes, in turn, impact the habitats of the Florida Keys, which then affect the fisheries. These same threats affect fisheries around the United States, indeed around the world, but the importance of the Keys to the world of flats fishing makes this an especially important fight to take on. Other threats to the fisheries are also of concern. Sufficient information is lacking for bonefish, tarpon, and permit fisheries in the Florida Keys. Anecdotal information and recent research indicate both long-term and recent declines in flats fish populations in portions of the Florida Keys. There are suspected causes for these declines, but none have been adequately addressed. This Initiative is a multi-year effort that will involve participation by guides, anglers, conservation partners, and research collaborators to identify and address threats to the Florida Keys flats fisheries. Worked with the Florida Fish and Wildlife Conservation Commission to make bonefish a catch and release species in Florida. Collaborated with the Nature Conservancy and flats fishing guides to identify and GIS map their fishing areas. This information is being used in collaboration with Florida Keys National Marine Sanctuary and Everglades National Park to help guide ongoing management revisions and zoning strategies. Funded a study to examine whether changes in bonefish prey are affecting the bonefish population and fishery. It appears that there haven’t been significant changes in prey availability. Provided funding to a study finding the economic impact of flats fishing in the Florida Keys to be $465 million per year. Determined that bonefish in the Florida Keys grow two to three times faster than in the Caribbean. Continue and expand work to identify what habitat types are required for each life stage (juvenile, sub-adult, adult, spawning), and which locations are most important. As habitat types and locations are identified, their health and spatial extent will be assessed. Multiple methods of tagging and tracking will be used to determine movements of bonefish, tarpon and permit: tag-recapture, acoustic tagging and satellite tagging. It is essential to determine movement and migration patterns of bonefish, tarpon and permit so that conservation and restoration efforts can be focused. Conducting a comprehensive water quality assessment in the Florida Keys to determine whether decline in water quality has impacted bonefish and other flats species. Water quality testing has occurred in the past, but have not yet been analyzed in the context of the flats fishery. This will be addressed via mapping of water quality, flats fishing effort, and fish habitats; additional water quality sampling; and modeling of water quality, fisheries, and prey data. Bonefish tissue will also be analyzed to determine levels of contaminants that might affect growth, survival and reproduction. Two complimentary approaches will be used to determine the extent to which bonefish and tarpon in the Florida Keys are connected to other regional populations. Genetic Analysis – Tissue samples will be collected from bonefish and tarpon in the Florida Keys, Caribbean and Bahamas and analyzed to determine the level of connectivity between different locations. This will help to identify the extent that the Florida Keys bonefish and tarpon population is supported by local spawning or by spawning in other locations. Ocean Current Analysis – Since, after spawning, bonefish larvae live in the open ocean for 42-72 days (average 53 days), it is essential to know the ocean currents that carry the larvae. As we identify juvenile habitat locations, this analysis will allow us to estimate where they might have been spawned. As we identify adult spawning locations, this analysis will allow us to estimate where the larvae from these locations might be transported. Please email mark@bonefishtarpontrust.org if you would like to donate to this initiative or become a Corporate Sponsor. To help us collect bonefish genetics samples, click here.